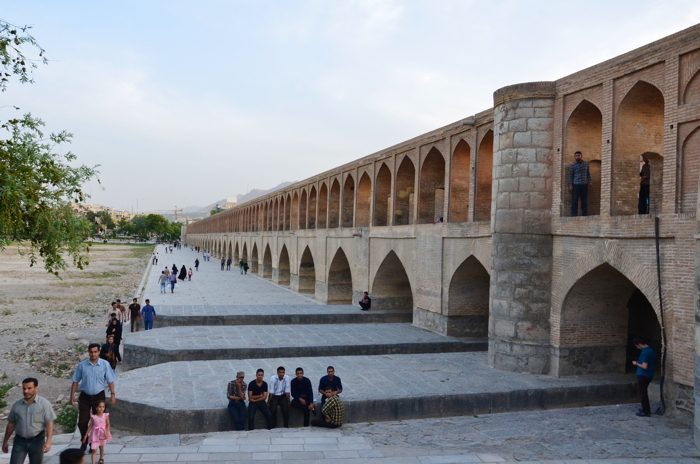 An Iranian proverb says, Isfahan is half the world. I say it’s at least half Persia. For indeed, all romantic notions of the Orient are fully serviced here. 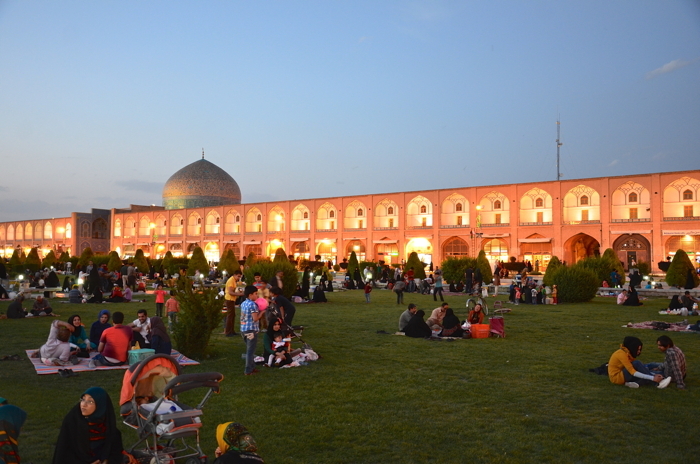 First, there is the Naqsh-e Jahan Square, a 500-meter area that is said to be the second largest square in the world after Tiananmen Square in Beijing – well, in the opinion of the local population it is the greatest square anyway. Especially on Friday, the weekly holiday in Islam, the people gather together. Big families, friends and lovers spend their evenings on the green grass and enliven the place with a lively atmosphere. 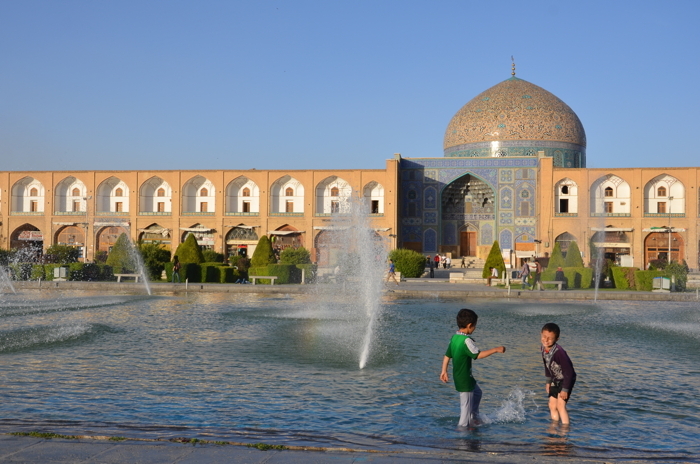 From all cities in Iran, Isfahan is defintely the most well-known besides Tehran. On the other hand, the city comes up with some of the most magnificent buildings in the entire Middle Orient. First of all there is the royal mosque Masjed-e Shah (or Masjed-e Imam) and the majestic Sheikh Lotfollah Mosque directly at Imam Square. Then there is as well the gigantic Jameh Mosque of Isfahan (Masjed-e Jameh) hidden behind the bazaar that no visitor should miss. Not to forget the lovely Behesht Palace and the impressive Forty Pillars Palace Chehel Sotoon amidst wonderful sprawling gardens. 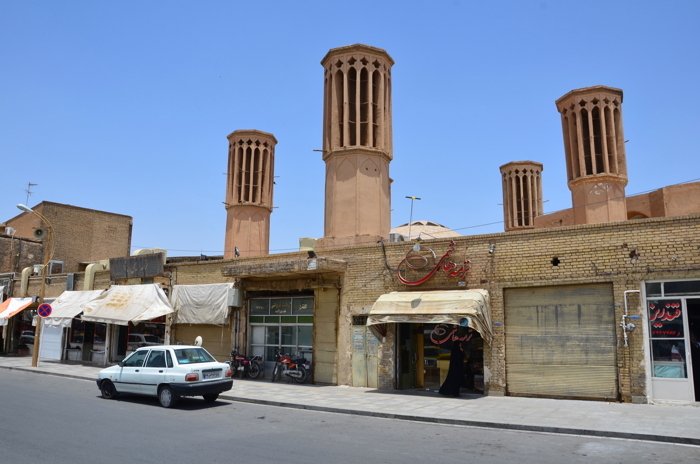 For the hot hours of the day, I can recommend a stroll through Bazaar-e-Bosorg Isfahan, under whose thick walls you can lose yourself extensively. 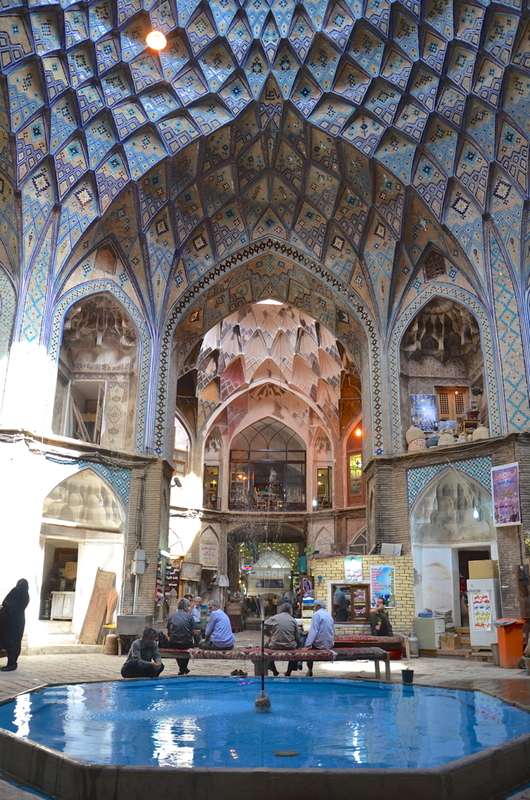 The bazaar is mainly famous for the finely crafted carpets and handicrafts. And in the evening, when the sun sets behind the peaks of the Zagros mountain range, the only thing missing is a visit to the Pol-e Si-o-Seh (Si-o-Seh Bridge), a 400-year-old 33-arch bridge that has lost any trace of charm and despite all the efforts of the government in the evening is still a popular meeting place for the young population and secret turtledoves. No wonder, Isfahan, one can easily fall in love with you. Yazd lies 250 km east of Isfahan and is the Persian desert city. One almost gets the impression that at any moment Luke Skywalker could pass by on a futuristic air vehicle. In fact, the old city of Yazd is almost completely made of sun-dried clay that ensures for a pleasant coolness inside the houses and for a light brown skyline from the outside, that is dominated by the Badgirs, ancient wind towers rising from almost every roof in the desert sky. Originally built at an oasis, the Mud City of Yazd is one of the oldest cities in Iran – the UNESCO even claims that Yazd would be the “oldest adobe city in the world”. 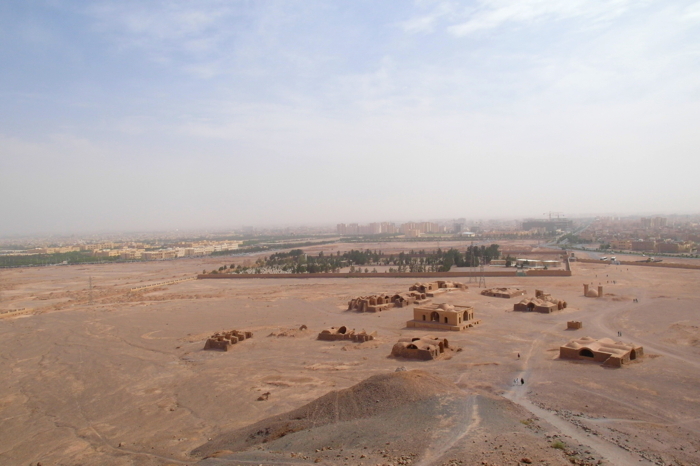 And besides the water museum, the Friday Mosque (Masjed-e Jameh) and the Ateshkadeh Fire Temple, the imposing Zoroastrian Towers of Silence just outside the city centre are also worth a visit. You can reach them in 15 minutes by taxi. 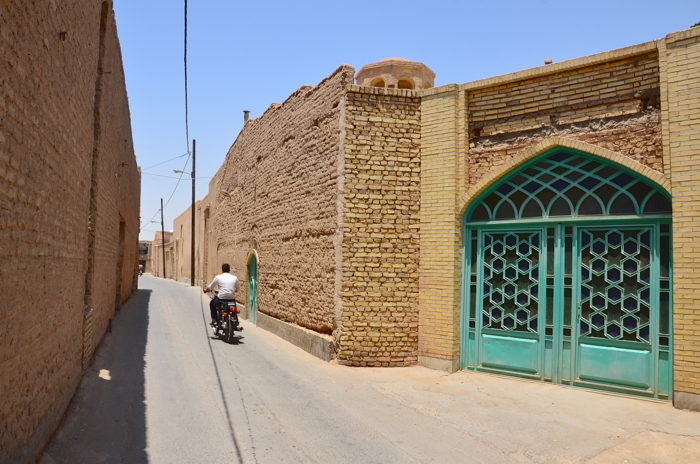 However, the best thing to do in Yazd is strolling along the winding streets of the old town, where one feels a little bit like on an alien planet. 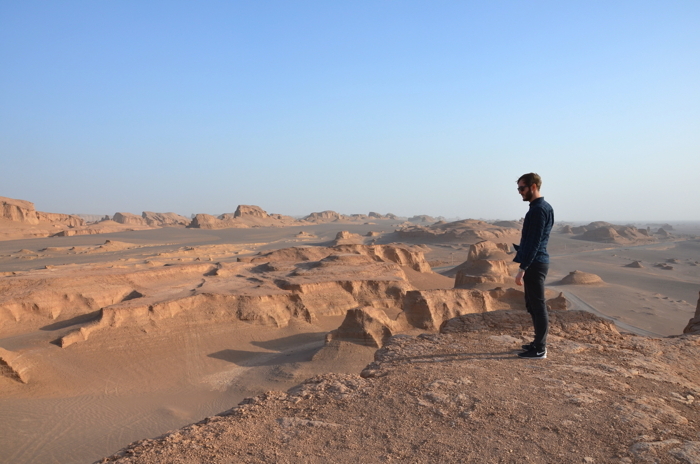 The oasis city of Kachan, just north of the metropolis of Tehran, is a good introduction for first-visitors to the country and my little insider tip besides the better-known sights and cities in Iran. 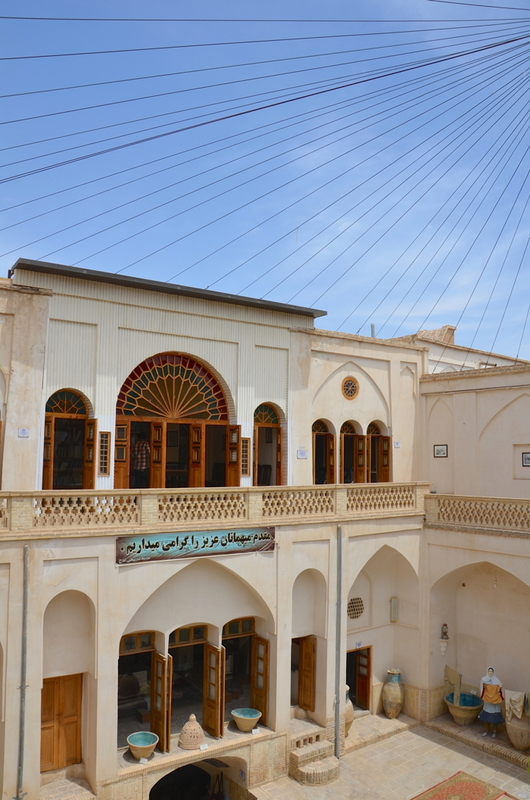 In addition to the extremely photogenic Agha Bozorg Mosque, it comes up with a small but nice bazaar including an impressive caravanserai called Khan Amin al-Dowleh Timche. 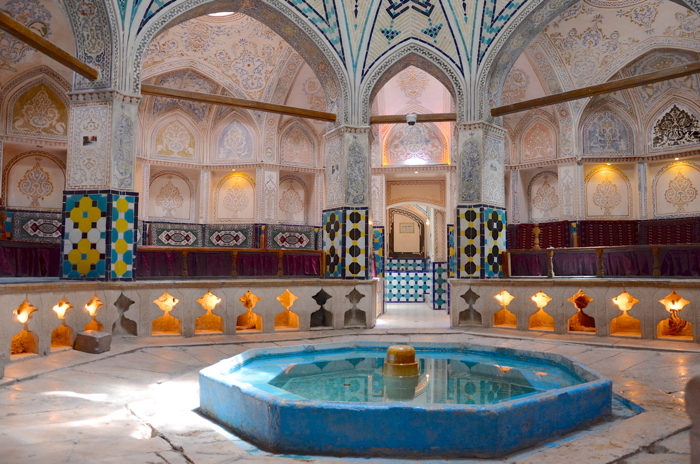 Especially a visit to the 1000 m² big Sultan Amir Ahmad Bathhouse is worth a visit, a historic bathhouse from the Safavid period in the 16th century (The Persian name is “Hammam-e Sultan Amir Ahmad”). Tip: Make sure to climb up to the roof, from where you have a stunning view over Kachan. 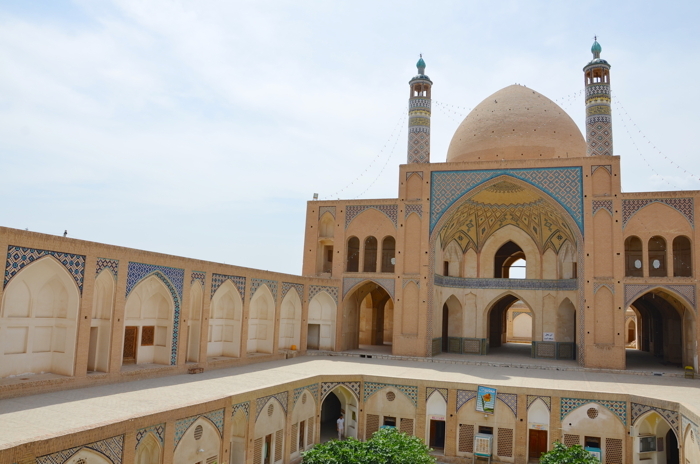 Cities in Iran: The Agha Bozorg Mosque in Kachan, here you are with non Prayer times often all alone. 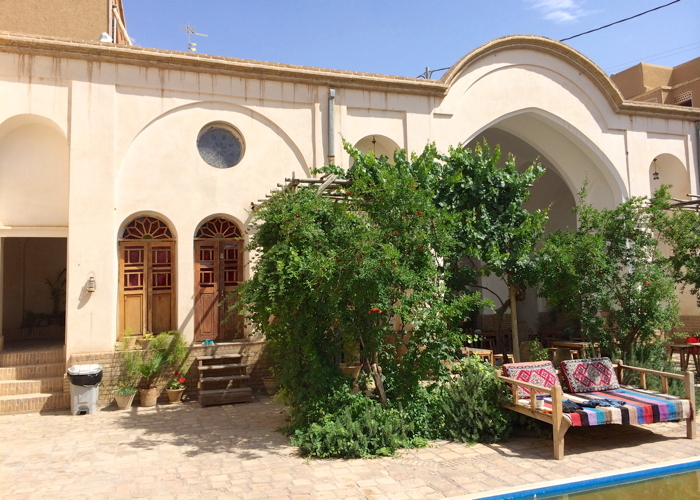 A traditional house in Kachan, Iran. It is also worth visiting one of the traditional houses that were built in the 18th century, such as the Tabatabaei House (Khan-e Tabatabaei) or the Ameri House. 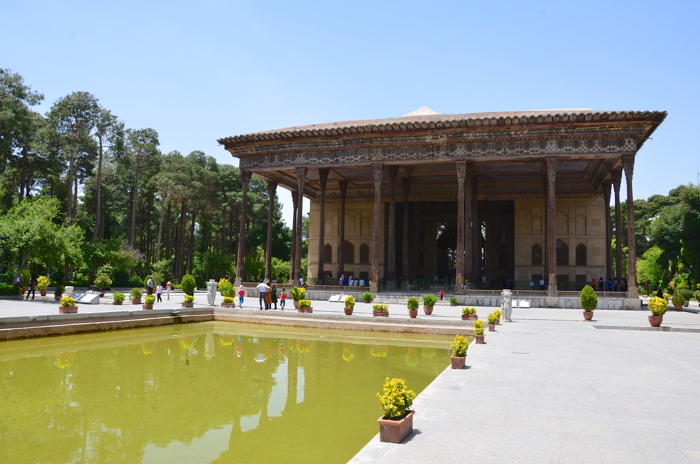 Kachan also comes up with one of the oldest and most famous Persian gardens, the Bag-e Fin, called the “Fin Garden”. Also Kachan is the perfect starting point for a trip to the Dasht-e Kavir desert (see below). 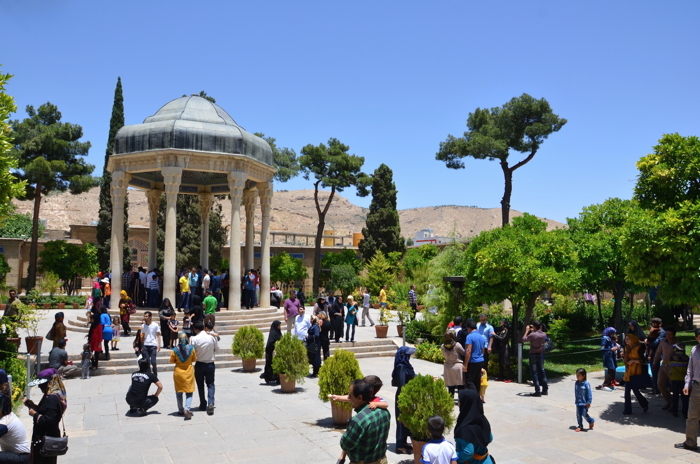 Shiraz is the capital of the central southern province of Fars and is regarded as the city of love, gardens and great poets, led by the major poets Hafez and Saadi, who even Johann Wolfgang von Goethe once adored. Today, their graceful mausoleums, tomb of Hafez and tomb of Saadi, in splendid extensive attract legions of Persian visitors. Even if the name of the city suggests otherwise, Shiraz is not a city full of delicious red wine. Beaucse just like anywhere else in Iran, alcohol strictly prohibited. Cities in Iran: One of the most visited attractions in Iran is the famous tomb of Hafez, the poet. When it comes to attractions in Iran who really no Iran-traveler should miss, you definitely have to name Persepolis. The former capital of the Achaemenid Empire is now one of the most impressive ancient sites worldwide. It is unclear, however, why the UNESCO waited until in 1979 to declare it a World Heritage Site. 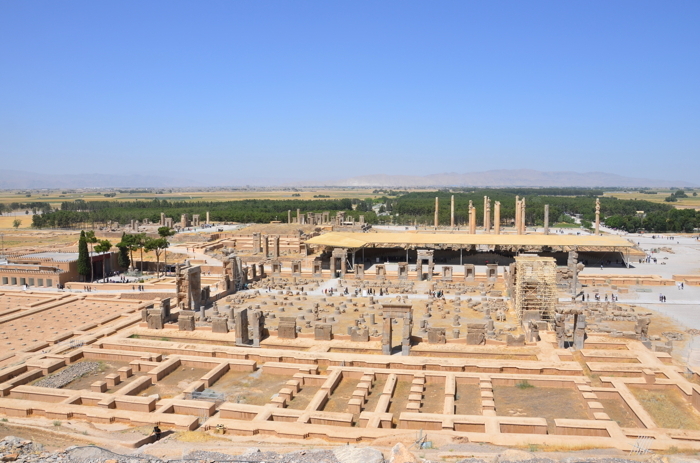 One of the oldest cities in Iran: Persepolis: the former capital of the ancient Persian Empire. In fact, the remains of a large resort with its huge pillars, walls and stairways, with amazingly well preserved and very detailed elaborate reliefs let no doubt about the former glory of this city. Anyone who comes here should be sure to book one of the local guides who lead through the ruins with full enthusiasm, while reporting with loving devotion of the traditions and architecture of Xerxes and others. The amazing tombs of Naqsh-e Rustam can be found six kilometres north of Persepolis and they are so huge, that one can see them raising at the horizon from far away. 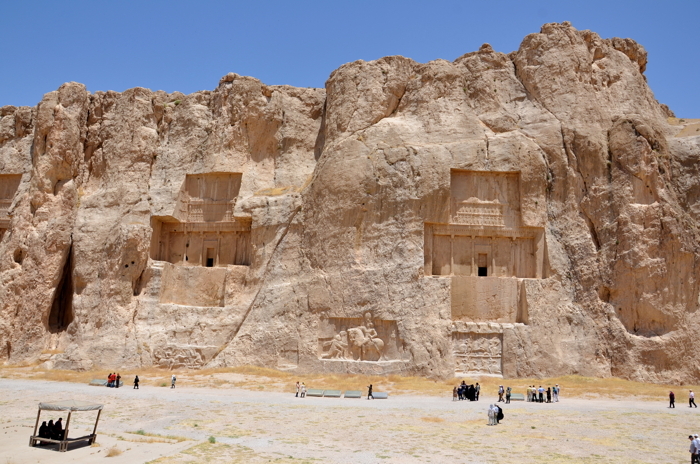 Some attractions in Iran are carved into the rocks forever, like the Naqsh-e Rustam near Persepolis. On a steep cliff that forms the border of a plateau, four huge Achaemenid tombs of great kings are carved into the rock as well as a number Sassanian rock reliefs. 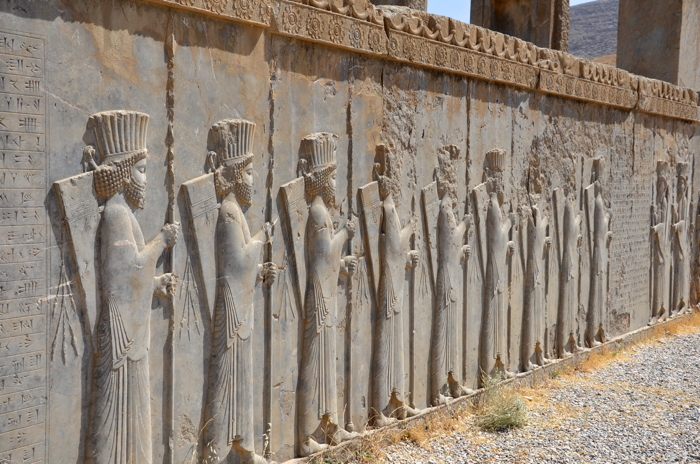 They are simply stunning and as well as the neighbouring Persepolis in surprisingly good condition. Yes, Iran also comes up with impressively huge deserts! 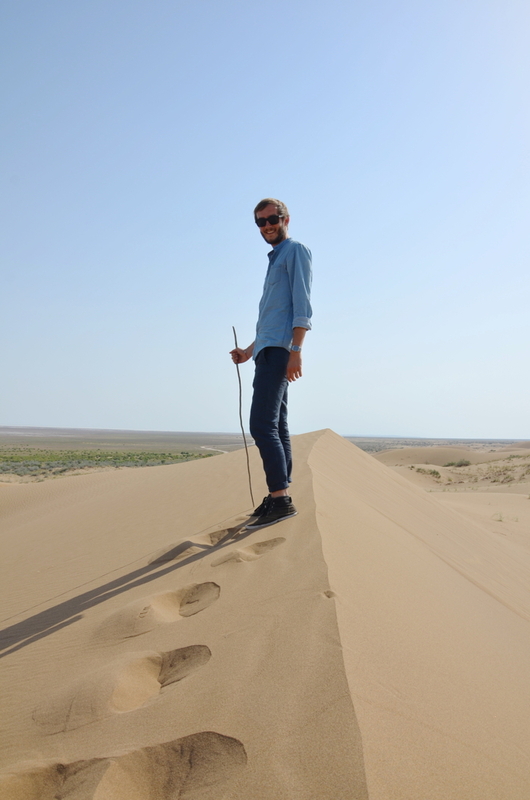 Everyone who has the opportunity to visit one of the deserts of Iran simply has to do it. Please do not just pass them just like many tourists on group travel often do. I can recommend the Dasht-e Kavir to anyone who wants to explore a saline desert. This great salt lake desert is located in the Iranian highlands between the Zagros Mountains in the southwest and the Alborz mountain range in the north and can seems incredibly surreal with its oppressive silence and the driest air. In addition, some smaller pieces of sand dunes reach to the great salt flats and are surrounded by old caravanserais and many straying camels. One should rather avoid a journey through the 166,000 square kilometres big Dasht-e Lut desert south of the Kavir in the summer months, as the temperature of Iran’s largest desert can increase to about 70 degrees, no joke! Otherwise, a visit to the eroded wind mountains called the Kaluts is worthwhile. And then there are the famous citadels of Iran. Particularly worth visiting are the cities of Rayan and Bam, that offer the most beautiful Clay fortresses of the country. The latter was destroyed almost to the ground by the devastating earthquake in Bam in 2003. Since then, hundreds of archaeologists are busy building up the mud walls of the venerable Arg-e Bam again. 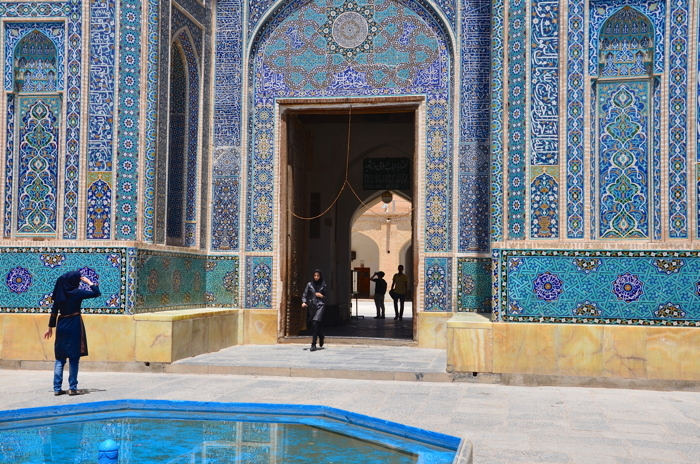 A trip to one of the most important cultural monuments of Iran is still worth the effort. 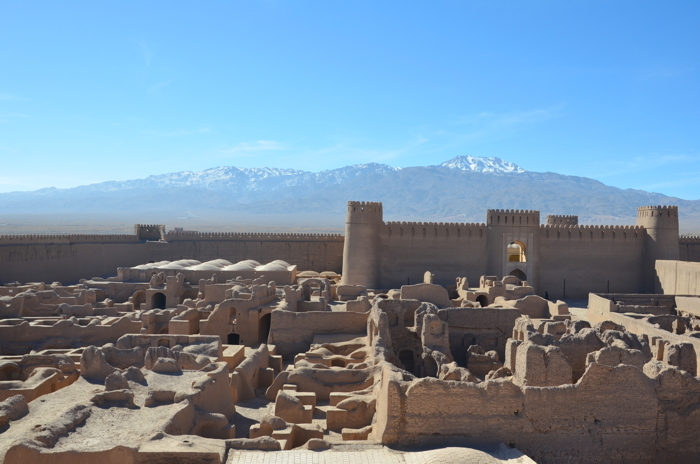 One of the most unique cities in Iran: Bam with the famous Citadel of Bam. However, my favorite fortress is the other one: the citadel of Rayen. It is located about 150 kilometres northwest of Bam and was remained mostly untroubled by the century earthquake. The Arg-e-Rayen once stood in the shadow of mother-Arg-e-Bam citadel for a long time. These days it attracts more and more visitors, of course also because of the severe destruction in Bam. But maybe also because of the almost too perfect image of the imposing loam castle at the foot of the majestic Mount Hezar in the background, that is truly something that you won’t forget so quickly. 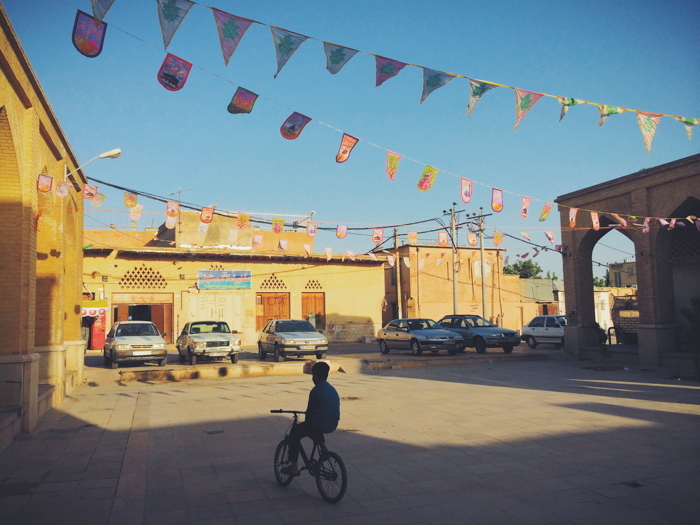 Some of the most attractive cities in Iran are older than you might think. Pure nature and a touch of Monument Valley: Qeshm Island is located in the Persian Gulf, it is a free trade zone and therefore a year-round destination especially for wealthier Iranians. Do not miss the impressive Canyon, or “Valley of Stars” as it is called by locals, a Canyon only build by shift of plates, water and wind. Must-See places and cities in Iran: The mangrove forest of Qeshm Island at the Persian Gulf. 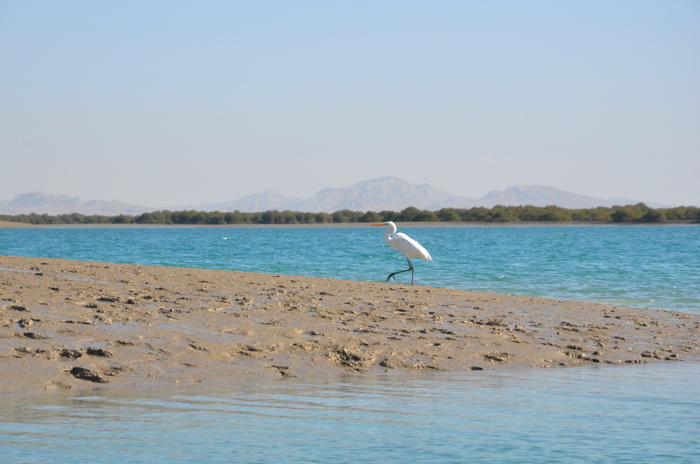 Especially worth visiting for outdoorsman and bird lovers is the Hara mangrove forest on the north coast of Qeshm Island, which is not only popular by tourists, but also beloved by migratory birds. The incredible biodiversity can be great for a one-hour excursion with a fishing boat, although this comes out not to be very cheap. Tehran is certainly the most “cosmopolitan” city of the country and especially as a Western woman in Persia one of the most pleasant cities in Iran. On the other hand, Tehran is a prime example of man-made wild confusion. Greater than Mumbai and with at least as much smog as in Beijing, the city is still the common start and finish of each Iran tour. But for good reason! 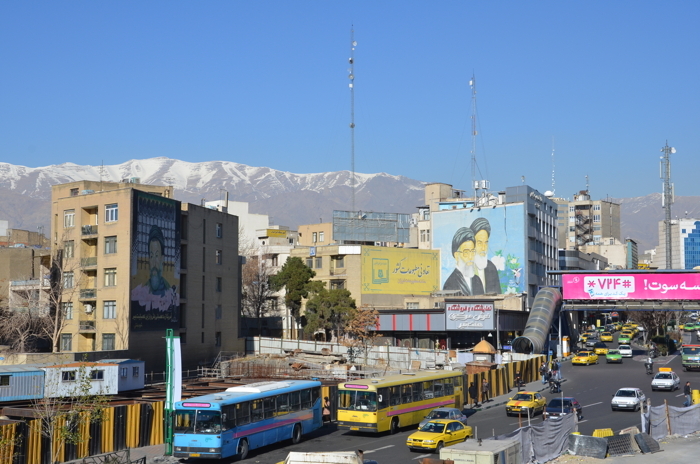 Cities in Iran: On a good day in Tehran you can see the Alborz mountains. On bad days only 200 meters far. One of the most famous sites in Iran: the Golestan Palace in Tehran. 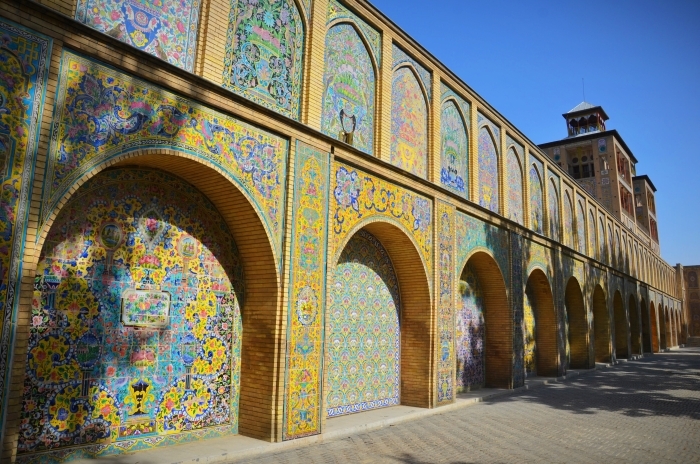 First there is the impressive Golestan Palace with its colourful facade tiles and unique mirror rooms. Then there is the largest covered bazaar in the Middle East: the 200 hectares big Grand Bazaar of Tehran, which looks more like a city within a city. Cities in Iran: Tehran metropolis from up above. Particularly not to miss is also the National Jewelry Museum that is probably better secured than the crown jewels of the British royal family. And then there is yet another never-ending attraction of the city: the traffic jam of Tehran. But this is definitely something everyone has to see with their own eyes and smells with their own nose.